You know the rest. And if you are reading this article, you already know why we are here. Like many Americans, for years I thought that this was just a simple vowel-chime. But, Oh! was I wrong! These suckers (literally) are coming out of the nursery rhymes and making a home underneath your sheets. 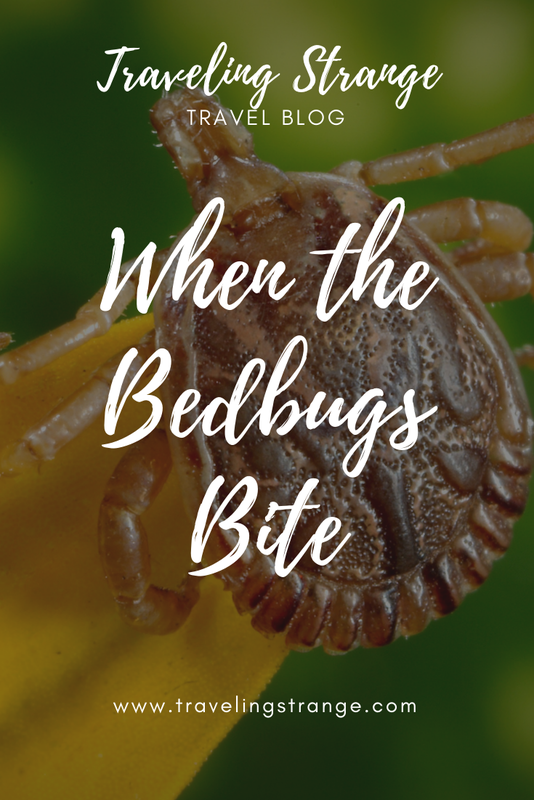 Until recently bedbugs had been virtually eradicated in the West, due to increased global travel, bedbugs are now on the move and on the rise all around the world. Lucky me, I've have had four different encounters with the pests. The first was back at my mother's home in New Jersey. Her tenant went away on vacation and brought a legion of unwanted pests with her. They the migrated upwards and infested my mattress--which I ultimately had to throw away. Several years later, I brought a solitary bug back with me from a hostel in Scotland. Being my mother's daughter and having lived through this situation before, I immediately got to work. I bagged everything up, broke out the bleach and bought a heavy duty mattress cover. I was terrified that it would spread all over the flat and terrorize my five other roommates. My to my delight (and mild disgust) I found a singular drowned brown bug in my comforter. I had no more issues after that. Until two years later, when I moved into an apartment in Valencia. Or at least when I attempted to do so. Let me set the scene for you. After two years of living in Spain, I thought I had a good understanding of how the housing market worked as an outsider. My strategy was to find something decent as quickly as possible and lock it down. Experience had taught me that the more time that I spent looking, the fewer options I would ultimately have. I'd also have to spend more money on temporary housing. I had neither time nor money to waste, so I was trying to get it done as quickly as possible. No. I learned that the best thing was to end the search as soon as possible and be on my way. So, when I found a two bedroom apartment only a few days into my move to Valencia, I decided to jump on it. It was in walking distance from my Airbnb, it was in the center of downtown and it was reasonably priced. The guy wanted a the first month's rent and a deposit upfront--although I had to wait three weeks to move in. Writing it now, I can see where I went wrong. But the request didn't seem outrageous at the time. Although, I did find it odd that the room that I was taking was never occupied during the many times that I visited, but apparently I couldn't move in until the next month. The guy kept insisting that his friend was staying in the room. The first time he was in Greece and the second time I asked, this friend had made it to Seville. Nevertheless, I wasn't allowed to move in. Unless, he claimed a week later that I paid him more money. This time would have been the for the two weeks remaining in September. At that point, I had had enough and told him no. I had already booked another Airbnb in the village where I was to begin working. And frankly, I didn't understand fully how the empty room was now available--for a price. But seeing as I didn't have any better options at my price point, I decided to go for it. Boy, was that a mistake worthy of the books. When I finally arrived two weeks later after staying in a hellish Airbnb, I found that both bedrooms were completely empty and the bedding in both rooms had been stripped bare. I found this rather odd considering the fact that the girl in the other room was not supposed to leave for another two weeks. Yet both rooms were empty. When the guy finally arrived, he immediately began to complain in warp speed and in Spanish about all the work he needed to do to prepare the apartment. Up until this point, all of our conversations had been in English. And while I had a working knowledge of Spanish, but his English was far better and he knew that. Which is why I stopped him when I heard him mention "bugs." Through his fury of words, I got something like "exterminator" and "is coming on Wednesday." It was there that I stopped him and told him to repeat what he was saying in English. That's when he said verbatim, "If you see a bug, kill it. Then call me." Bug. Wholly unspecified. I assumed that he was talking about roaches or ants. I had no idea that he was talking about chinches which is the Spanish word for bedbugs. A word that he never said. So, I spent the first night comfortably in nice cool sheets and I woke up covered in bug bites. If you have never had the misfortune of encountering these pests, consider yourself lucky. But also be aware that they don't feel like normal bug bites. Unlike mosquitos, bed bugs bites are far more intense. They itch so much that it feels more like a slight burning sensation. Bedbugs also tend to bite in rows of three, so your misery is tripled. To top it all off, I am allergic to most bug bites. So, I not only have deal with the irritation, but also with high levels of swelling. It was horrible. I looked like I was suffering from some sort of plague. Still I wasn’t exactly sure what had happened at first. It was until I was at work and the burning reached its fever pitch that I made the connection. He was talking about bedbugs. Why, I couldn't understand, would he even allow me to move in knowing that the bed I was going to sleep on was infested with bugs. It also explained why the room remained unoccupied although someone was living there. The reality was that he knew the entire time that the apartment was infested. It was sickening. And that night I decided to confront him on it. Find out what happens next week. I don't want to be the kind of person who is good at this job.